A little progress on everything! I've actually managed to get more stitching done than I expected but not enough to warrant pics since I've been switching between projects. I also kitted up a magazine chart into a kit for a dear friend. I must put it on my To Do list because I love it too! I found some stash I fancied today on someone else's blog. 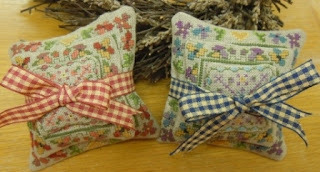 These are called Lavender Tumbles and I found them on the Cross Stitch Guild website. Can't decide which colour I like best. 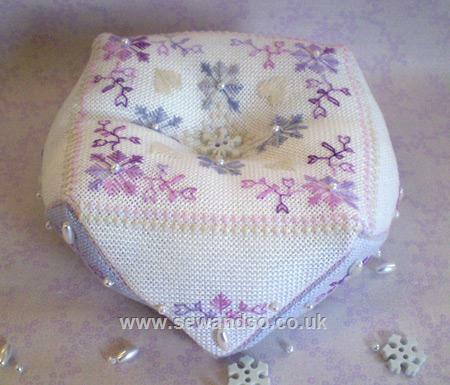 Then while I was searching for said Lavender Tumbles on Sewandso it came up with this kit which is also quite pretty. It's Lavender and Snow Pearls Biscornu kit and I think it was Polstitches. Bit out of my price range though at £13.50! 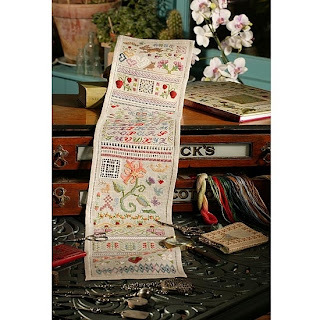 I also really like the Embroideress but 1) the whole kit is way out of my price range and 2) I don't think I'm quite that skilled with a needle yet!! As for the house, the kitchen ceiling is finished but we don't know what is happening with the floor. The landlord hasn't spoken to us and we've banned his father from coming to the house because the last time he just walked in and proper laid into the gas man who was fixing the boiler and then had a go at me on the way out. I'm not putting up with that! I'm surprised the gas man came back to finish fixing the boiler. We've started cleaning up the mess now but the insurance isn't going very quick. Anyway the good news is we may be moving out so watch this space for less stitching and more packing :(( Poor us our married life has seen us through 4 addresses now. My packing record is the whole house in 5 weeks! And we said we wouldn't move again until we bought a house...damn useless landlords!! In between everything that's happened lately I managed to get a little stitching in. I stitched a bit on my Summer Sampler before I ran out of a few colours and since I wasn't at home to refill I started back on Baby Boy Sunshine Line. I finished off the beading and backstitch on the boat and the giraffe. I can't see me getting much stitching in for a while anyway but I want to try and get this project finished. We've moved back to our own house now but don't have the use of the kitchen or basement room. We have a makeshift kitchen on the livingroom windowsill and are going to my parents for food and laundry. The insurance claim for our contents is progressing well at least but the landlord is a bit slower on his part. The kitchen ceiling is nearly finished but the downstairs floor needs replacing. I've got so much to clean and wash including the kitchen from floor to ceiling. I am worried about the whole thing since the landlord's father has done most of the fixing work and I don't trust the man as far as I could throw him. I'm not sure what is going to happen with the floor. I am also awaiting the all important phone call from the CSSIW for my inspection since I am in the process of registering as a childminder. At the moment there is no way I am ready for that! I had noticed while reading some blogs recently that a few people had joined this TUSAL and thought to myself I wonder what that's all about then?! Today I finally found a link to the original founder and decided to sign up. Thought I would share this funny video I recently discovered. Made me laugh anyway! 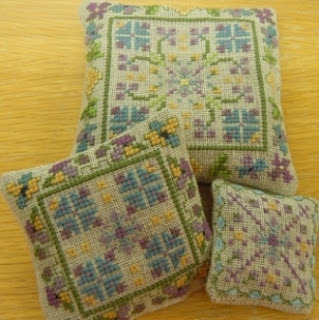 I'm hoping to stitch a lot more this year now I've got back into doing some again. I really need to get some WIPs done out of the way so I can do some real nice stuff for myself. I definately want to finish Baby Boy Sunshine Line for my nephew Freddie and Feathers & Friends for my mum. I've also got a lot of little projects that are ancient that I want to finish and get out of my project box. I'm thinking I will actually make a start on Monopoly and our wedding sampler United in Love too. I'll probably work on some other WIPs too but these are my main goals at the moment anyway. 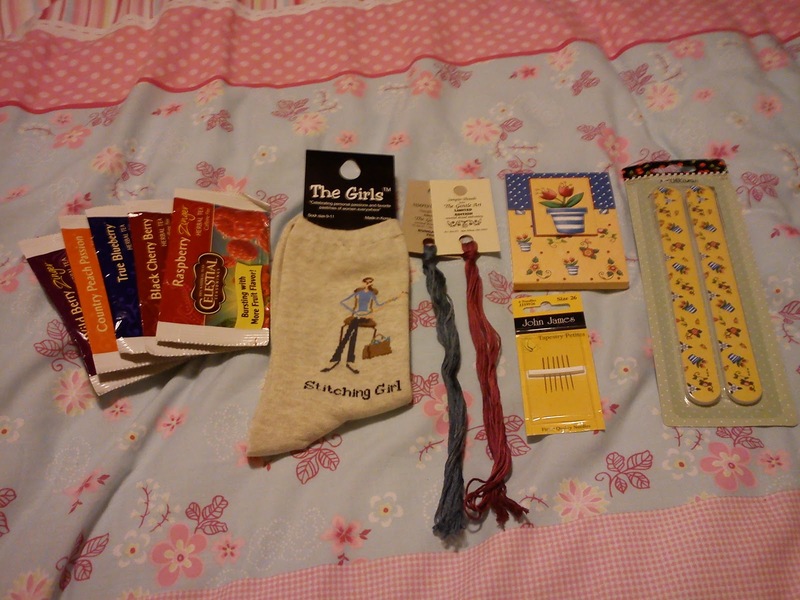 I received my Sock it to Me exchange goodies from Shelley. I got some 'Stitching Girl' socks, a little notepad and some emery boards, GAST threads, some fruit teas and John James petite needles - I LOVE these they're just the perfect size I want!